As you probably know, one big advantage the Nintendo Switch has over its rivals is that you can play it anywhere. However, being portable has the big drawback of limited battery life which can really ruin a good gaming session. Console games are demanding on the hardware which means that they eat through battery like there’s no tomorrow. Nintendo reckons you can get up to six hours on a single charge but with most games I find I’m lucky if I get much over three hours of play. Sure you can hook the Nintendo Switch up to a power outlet and play on your TV but what do you do if you need more juice when out and about? That’s where the S-Charge from InDemand Design comes in. The S-Charge is a battery case for the Nintendo Switch which comes with a surprising amount of features. Opening up the box reveals the S-Charge battery case, a Carbon Fibre clam shell case, two screen protectors and a USB-C charge cable. First impressions, including the actual box that everything comes in, are that everything looks the part and is well made. Out of the box the battery case might have some charge but it’s probably best to stick it on charge for a while before first use. The battery case has a small button on the left side which when pressed indicates the level of charge left with four small white LEDs. Each one represents 25% power so it’s a handy guide for how much is left. The battery case itself is fairly heavy as it contains a 10,000mAh battery which is capable of extending your play time by up to 12 hours. Attaching the battery case to your Nintendo Switch (and removing it) is very quick and easy. You simply rest the Switch into the case, ensure it’s lined up with the charge port. Next you fold the top down and that keeps everything in place. When connected the added weight of the case is fairly substantial and it does make the Switch feel a lot heavier. Expect fatigue to set in sooner if you plan to play this way. The battery case has that lovely soft touch coating which gives it a real premium feel. The top part that folds down has slots cut out that allow you access to the top of the console for things like the power and volume buttons, headphone jack and game card slot. Due to the thickness of the case it does make access to these a little tricker but this is a minor issue. One advantage is that the battery case adds a certain amount of protection for your beloved Switch console. On the left of the battery case, in addition to the power level check is the USB-C port for charging the battery. There’s also a normal sized USB port that you can use to charge your mobile phone from the S-Charge battery. This is a neat touch that saves you needing to carry around a plug for you phone charger or find a plug socket to use it. The back of the battery case pulls out to reveal a much improved kickstand. This is another welcome feature as the one built into the Nintendo Switch itself isn’t great. The S-Charge kickstand is far more stable and can be pulled out to different angles to suit the game you are playing. Once the kickstand is open it also reveals a handy slot for two Nintendo Switch game cards. 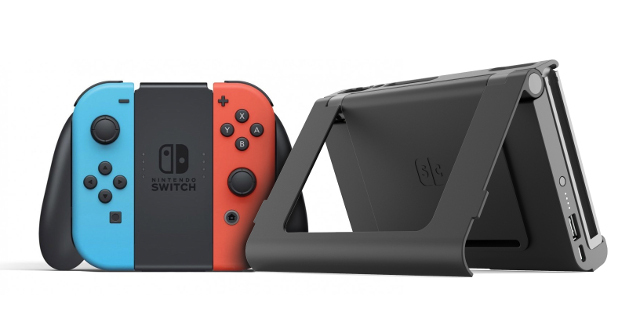 The S-Charge battery case is capable of charging the battery of your Nintendo Switch. It can also charge while you’re playing so there’s no waiting for ages while the console charges up. While away from a power source, the S-Charge allows you to play your favourite game for up to 12 hours longer than usual. In testing most games seem to last a good 10 hours more. This makes taking your Switch on a long journey much more appealing. The final thing to discuss is the Carbon Fibre carry case. This comes in a classic clam shell design with a zip around. It’s rather large because it’s able to house your Nintendo Switch while it’s docked with the S-Charge battery case. It’s perfect for taking everything with you and keeps it all well protected. Inside the top is a mesh zipped compartment to put any cables you need. There’s also a flap that’s padded on one side to protect your Nintendo Switch screen. On the other side of the flap are small pockets where you can store an additional 8+ game cards. Overall I’ve been incredibly impressed by the S-Charge and would highly recommend it to any Nintendo Switch owner. It makes taking your Switch with you a lot easier and gives peace of mind that it’s going to be protected too. The biggest bonus is that while carrying it around it’s also charging up ready for your next gaming session. The only minor downside is the weight when holding the Switch docked to the battery case. However, the brilliant kickstand removes the need to hold it at all. The S-Charge was reviewed using a review unit supplied by InDemand Design. Buy the S-Charge on Amazon UK.